Heart disease can be a scary thing. The good news is, it’s possible to take steps to lower your risk. I’m serious. According to the National Heart, Lung, and Blood Institute (NHLBI), “The main treatment for atherosclerosis is lifestyle changes.” Since plaque buildup is at the root of many types of heart disease and health complications (including heart attack and stroke), taking steps to improve your lifestyle could help you reduce your risk of developing it in the first place. Let’s take a two-pronged approach to heart disease prevention: diet and exercise. So, what does a healthful diet look like? The NHBLI’s TLC diet or DASH diet may also help you prevent heart disease by lowering various heart disease risk factors. Check them out! Remember, making the effort to improve your diet is worth it. “Eating a heart-healthy diet is important for managing your blood pressure and reducing your risk of heart attack, heart disease, stroke and other diseases” (source). Now let’s move on to the second realm of lifestyle changes to prevent heart disease: physical activity. Talk with your doctor about what kinds of physical activity are right for you. Remember, it’s wise to start slowly and work steadily. This will help you stick to your new program while reducing your risk of injury. 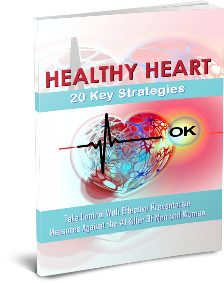 There are other ways to reduce your heart disease risk too. If you smoke, quit. If you’re overweight, take steps to manage your weight more effectively. Consider reducing your alcohol intake, and try to find effective ways to deal with stress. All of these could improve your health and lower your risk of heart disease. And remember, “Eating a healthy diet and including exercise in your routine can give you the edge in the fight against heart disease and stroke” (source).